Snow Peak Wabuki Chopsticks. 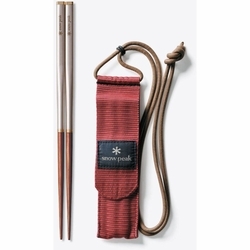 Featuring an elegant bamboo tip and squared off stainless steel handles, these collapsible chopsticks will last you a lifetime of sushi and ramen. Includes a carrying case to travel with you anywhere. Material: Grip: Squared Stainless Steel | Tips: Bamboo Cap: Brass, Case: #10 Canvas Fabric.